One of our favorite meals is spaghetti and meatballs. My girls love it and it’s a perfect recipe for Sunday dinner. I came up with a perfect twist on an age old tradition by turning it into Mini Meatball Spaghetti Pie. It’s the perfect fun meal for the girls or even a perfect game day appetizer. My girls are definitely picky eaters, but they gobbled these up. 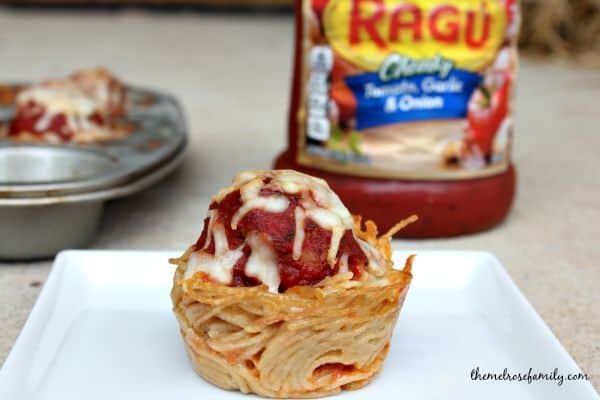 I made these as easy as possible by using Ragu Spaghetti Sauce as well as frozen meatballs. I love knowing that when I use Ragu I’m choosing a sauce made with all natural ingredients that are farm grown. Since the sauce made this much simpler, I was able to create mini spaghetti pies. The spaghetti pies are so easy to make. Check them out in the video below. You need to be sure to grease the muffin tin so that the spaghetti doesn’t stick, but there’s three distinct tips to create the pies. 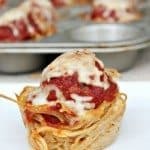 The spaghetti is combined with egg, butter and parmesan and then layered into the muffin tins like nests. On top of each nest a ricotta and parmesan cheese mixture is dolloped. A meatball is placed on top and then a layer of sauce is poured over the meatball and it’s sprinkled with mozzarella cheese. They are then baked to perfection. I love when an age old traditional meal like spaghetti and meatballs can get turned into something as fun as Mini Meatball Spaghetti Pie. It let my girls see that being creative in the kitchen can make a great meal. 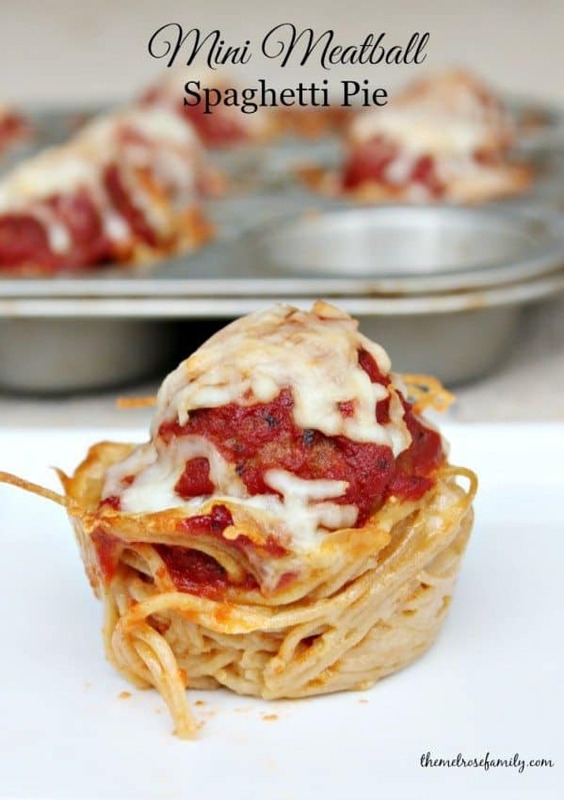 Mini Meatball Spaghetti Pies are the perfect appetizers that are kid and adult friendly. Preheat the oven to 350 F. Grease each muffin tray with coconut oil. Combine the eggs, butter and parmesan cheese and pour over the cooked spaghetti. Spread the spaghetti mixture in the greased muffin tray by creating nests. Mix together the ricotta cheese and parmesan cheese and spread over the nests. Place a meatball on top, cover with spaghetti sauce and sprinkle with mozzarella cheese. Bake for 30 minutes. Have you tried freezing these? As a lone Sr. these would be wonderful for a winter evening meal if they could be frozen and reheated a couple at a time. This look wonderful, if not a little dry… Did you add any additional sauce to them upon serving?